New to this forum. Please help! 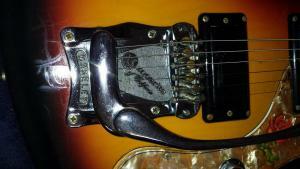 ]My husband bought a Mosrite electric guitar in 1967-68. We are going to sell it due to moving. I have been trying to find out how much it may be worth along with some details. It is a VEntures 11 model. SN-b649. 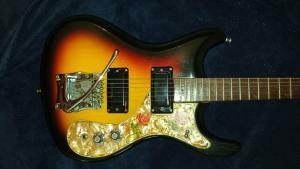 It is the Sunburst design with penalized pick guard. We have the original case. The inside is in great shape although the outside has taken a beating. The guitar is in great condition. If you can tell me how to post pics I would appreciate it. I want to sell this guitar to someone who will appreciate it. Thank you. Re: New to this forum. Please help! Welcome, I'm sure you will get honest appraisals from this forum, and will find a buyer. Posting pictures will start the drooling and be able to find out exact details on the make, year, etc. 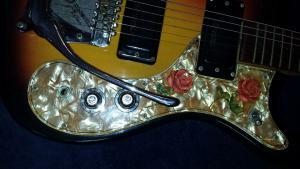 it's a mosrite ventures II, bj 1966, serial B649 and the numbers 7 8 was add later ... maybe by customing the pickguard. Yes Phil thank you very much. I could not figure it out. As for monetary value, I think it depends on who you sell it to and its condition and what else is included. 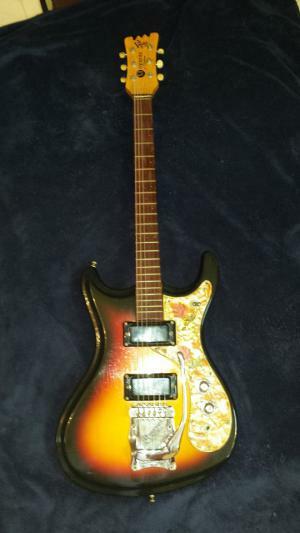 If the one you're asking about is all-original except for the pickguard (Meaning that the pickguard is the only replaced part other than the strings) and it's in fine shape condition-wise and playing-wise (And since you're apparently including the case) you may be looking at between $1,500 to $2,500 (On the high end) if you sell it to a person and not a store. 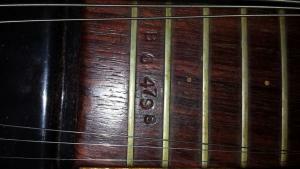 It does appear to me that the frets, tuners and finish may indeed be original - They're period-correct for early 1966. This is just my personal estimate though. If I were making an offer today I'd say "$1,900" or so plus shipping, Assuming it must be shipped to me and I'm not buying it in-person. It's a fine guitar design and fits me well, But I already have one like it. 1970s Blues Bender Body 1 - "Funnily Routed Body"
I was trying to figure out the value of a Mosrite bass recently so that I could make a fair offer to the seller. I looked on ebay for similar basses in 'Completed Listings' so that I could see what the instruments actually sold for, not the pie-in-the-sky asking prices. A lot of people selling Mosrites on ebay list the serial number so you can get a good idea of what an instrument made near the time yours was sold for. 1965 Ventures Model Bass. Original owner. 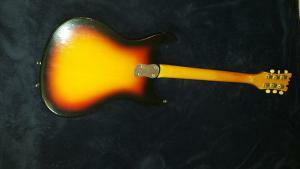 Early 70's bass. Saw this one on Facebook and it's a beauty, the pickguard especially! Good luck with the sale.